A sample from Driftwood’s sweets menu. Driftwood Kitchen’s new lineup of spring desserts include sweets composed of artisanal ingredients that are prepared in-house daily, complemented with dessert wines and ports, says pastry chef Rene Baez. 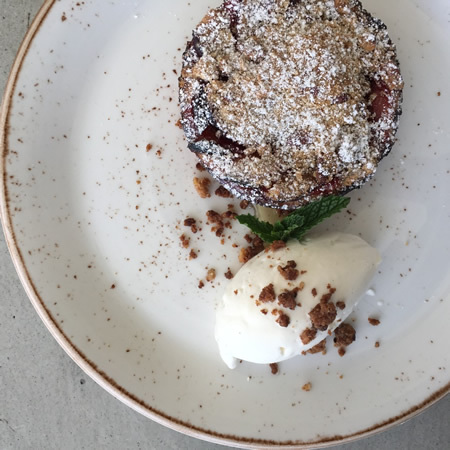 Among his new creations is a rich Braeburn apple brioche served a la mode with a slab of Turkish honeycomb, a warm plumb tart crumble, a ladyfinger banana split and a variety of sorbets and espresso creations. The dessert menu is available at Driftwood Kitchen, 619 Sleepy Hollow Lane during lunch and dinner. Celebrate Mother’s Day, Sunday, May 10, at the Montage Resort with special dining offers including a 12-station buffet, open from 10:30 a.m. until 5 p.m., with entertainment by a jazz trio and a complimentary photo for $125 per adult and $55 for children 4-12. At The Studio choose between a five-course chef’s tasting menu or a la carte dining from 5 p.m.-10 p.m. for $140 per person or $225 per person with wine pairings. A gift for mom is included. The Loft will offer a four-course prix-fixe menu, the Bistro menu or their regular dinner menu from 3-10 p.m. for $105 per person and $35 for children. Also includes a gift. For more information and reservations, call 949.715.6420.